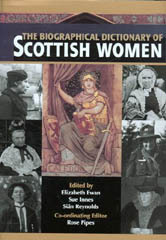 First conceived by the Scottish Women’s History Network, (renamed Women’s History Scotland in 2005), this monumental Dictionary contains over 800 biographical entries supplied by over 270 contributors, and must surely represent one of the most important landmarks in Scottish publishing history. The only non-negotiable criterion for inclusion in this massively impressive work was that the subject had to be dead. (While this criterion may not prevent readers from quibbling about who is in and who is not, it at least ensures that no living woman can feel slighted by not being included.) Another fundamental criterion for inclusion is of course ‘Scottishness.’ The editors freely admit that in the application of this term they have been generous: ‘to be included an individual should have been born in Scotland; or have lived in Scotland for an appreciable period, or have influenced some aspect of Scottish national life.’ They also carefully add that, ‘being born outside Scotland to Scottish parents was not regarded as qualification enough, unless the woman concerned met one of the other two criteria.’ Nor was ‘fame’ a sufficient criterion for inclusion: many of the women featured are not at all well-known, despite the significant contributions they made to Scottish life. Also well-represented here are those women who were involved in the political life of Scotland, particularly in the late nineteenth and early twentieth centuries. It is noteworthy that anti-suffragists feature alongside suffragists themselves. The editors cannot be accused of any bias here, for all shades of political opinion are included. Two interesting groups of women also feature: those quasi-historical, mythical or fictional women, such as Jenny Geddes, who swore, and Scota, the eponymous ancestor of the Scoti. And the iconic status of Maw Broon, the matriarch from Glebe Street, Dundee, is now assured for all time. Also included are those who inspired famous fictional characters, such as the models for Muriel Spark’s Jean Brodie and Walter Scott’s Jeanie Deans. A tiny handful of entries are vitiated by their over-reliance on conjecture – ‘apparently’, ‘probably’, ‘perhaps.’ Given that one of the aims of this dictionary is to ‘provide accurate, readable and stimulating information’, in the absence of hard information, speculation about what might have occurred in a subject’s life is plainly unsatisfactory and should really have no place here. The role Scots played in the colonialisation and conversion of indigenous people in other parts of the world is an inescapable fact, but it makes me a little sad to read about the number of daughters of the manse who took the liberation theology and civilising instructions of the General Assembly of the Kirk of Scotland across the seas in the name of God and Empire. But these facts of Scottish history are impossible to escape. Given that, not surprisingly, a number of pre-Reformation nuns and abbesses figure in this work, it is a shame that Dame Laurentia McLachlan, the post-Reformation Coatbridge-born Abbess of the Benedictine community at Stanbrook, should not merit an entry. The artist and dancer Pat Douthwaite, whose work only now after her death is being given the consideration it deserves, is sadly not included. But the editors do point out that far more names than could be accommodated were proposed. Surely Queen Victoria, her daughter Princess Louise, Duchess of Argyll, and her great-great-great granddaughter Princess Margaret Rose could have been ‘backfiled’ to make room for other names with greater claims for inclusion? And what about that other Duchess of Argyll, Margaret Wigham, who was celebrated in song by Cole Porter, but not for her antics with the ‘Headless Man’ in the 1960s? And on the subject of royals and their attendants, ‘Crawfie’ gets an entry, but the present Queen’s nursemaid ‘Bobo’ doesn’t. Those innkeepers who provided premises and provender for convivial literary meetings (of men) feature, but sadly no mention of Marion Ritchie, from my neck of the woods, who inspired ‘Meg Dods’, keeper of the Cleikum Inn in Scott’s St Ronan’s Well. Concerning ‘errors’: the initials SSA are used to denote membership of the Society of Scottish Artists, not the Scottish Society of Artists, and I am not aware that the post-nominal letters RSSPWC have ever been used to denote membership of the Royal Scottish Society of Painters in Watercolour (singular). The accepted letters are RSW. Also, the entry for Jean Roberts, the Glasgow Labour politician, unnecessarily glosses Lord Provost as ‘the Scottish equivalent of Lord Mayor’. This should have been detected and removed at proof stage. _ given an airing after all these years. The Biographical Dictionary of Scottish Women is a unique contribution to the study of Scottish women’s biography and an outstanding reference work which yields discoveries on every page. At £60 it is an expensive purchase, but no home in Scotland should be without a copy.